After years of releases and rereleases of classic arcade games on just about every device that supports games, we’re in the midst of a renaissance of sorts. Many 80s classics are getting a New Millennium makeover in which the spirit of the original games are being injected into modern, techno-pumping, epilepsy-inducing games. The success of games such as Pac-Man Championship Edition and Space Invaders Extreme means that we can expect a lot more arcade classics to get this treatment, which brings us to the game at hand, Galaga Legions DX. For those of you who can’t quite remember exactly which classic game Galaga is, it’s Space Invaders style shooter (if you don’t even know what Space Invaders is, just Google it) that features insects that come swarming onto the screen, lining up in ranks, and then dive-bombing your ship. Its defining gimmick was that certain bugs could capture your ship in a tractor beam. If you later hit that bug, your ship would be returned to you and attached to your current ship effectively doubling your firepower. Now that we’ve established that, I can tell you that it doesn’t really matter whether or not any of that’s familiar to you - Galaga Legions DX shares very little with the original. 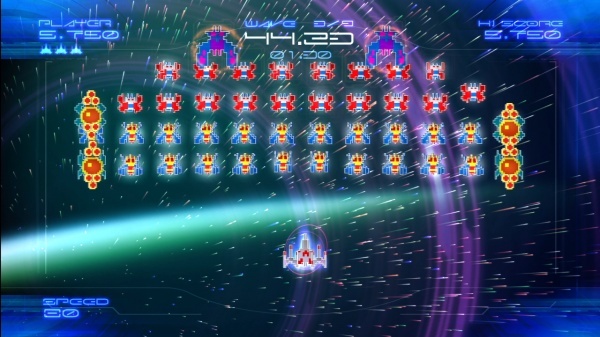 Galaga Legions DX is more shmup (shoot-em-up) than 80s arcade, with enemies flying in from all directions and, contrary to the game’s roots, a ship that is free to roam the entire screen and fire in any direction. Your ship has a pair of wingmen that move along with your ship and provide two additional streams of fire and they can be switched between two fire modes at the press of a button – in one they fire in the same direction as your ship and in the other they fire at different angles. In addition, you can also squeeze them into a tighter formation to reduce your bullet spread and concentrate your fire. It’s simpler in practice than it is to explain, and you’ll pick up on the simple and intuitive controls in no time. One major departure between Galaga Legions DX and most shmups is that that Galaga Legions DX is very easy to play. Even though there are swarms of enemies on screen at any given time, you have a lot of firepower to tear through their formations. In addition, the enemy swarms include explosive ships that can take out entire formations in quick chain reactions. You’ll rarely die in this game, and it’s far less a test of survival than it is a scoring run. There are only really ten short levels in the game and you can make a single play-through of the game in a bit over an hour. After that the idea is that you’ll want to go back and try and beat your previous best scores and to move up the online leaderboards, but in reality the lack of challenge and general lack of fun means that you’re unlikely to play through the game more than once. As for ties to the original game, there are alternate skins that let you give the alien ships an old school Galaga or even Galaxians look and the ship capture mechanic is still here, although in a drastically different form. The last stage of each level almost automatically hooks you up with an allied bug swarm centered on your ship. This gives you so much firepower that the last stage is almost always a cakewalk. Final Rating: 66%. Galaga fans won’t recognize the game, shmup fans will find it too easy.